I've added a star data spreadsheet on the sources page for people who want more detailed data on the stars that appear on the maps on this site. One more Sharpless nebula as seen in IPHAS. Sh 2-139 is in the Cassiopeia arc or perhaps in a region beyond that. Nothing interesting is said about it in the scientific literature. Here's another example of IPHAS magic. On the DSS2 image, Sh 2-89 is nothing but a faint reddish glow on the east side of the Vulpecula OB1 association. In this IPHAS image, this HII region comes to life with at least two emission fronts and interactions with a dark cloud. Sensitive hydrogen-alpha surveys are revolutionising our view of the night sky. Douglas Finkbeiner has combined three sensitive but low resolution surveys into one fascinating all sky image that I've used as the basis for a hydrogen-alpha commentary. Even more important than the big picture low resolution surveys are the higher resolution surveys carried out closer to the galactic plane. For several years, the only one available has been the AAO/UKST H-alpha survey of the southern sky, accessible through a set of digitally scanned photographic plates called SuperCOSMOS. This survey was imaged by the UK Schmidt camera at the Anglo-Australian Observatory in Siding Spring, about 500 kilometres north west of Sydney. I have used the SuperCOSMOS data to improve the images of Sharpless, Gum and RCW nebulae on this site that are visible from the southern hemisphere. Until recently there was no northern hemisphere equivalent to SuperCOSMOS, which meant that detailed hydrogen-alpha images were not available for important Milky Way regions like Cygnus, Cassiopeia and Cepheus. This has now changed. IPHAS is the northern hemisphere equivalent of SuperCOSMOS. The IPHAS survey was carried out by the Wide Field Camera on the 2.5 metre Isaac Newton Telescope, part of the Isaac Newton Group of Telescopes near La Palma in the Canary Islands. It has captured amazingly detailed images of northern hemisphere nebulae. Here's an example. The mysterious HII region Sh 2-124 is located at a distance of about 2600 parsecs towards the north east edge of the Cygnus complex. Almost nothing has been written about this nebula in the scientific literature. In the DSS2 (Digitized Sky Survey) image shown first you can discern a faint amount of nebulosity around the brighter stars. In the far more detailed IPHAS image shown second, however, Sh 2-124 emerges as a spectacular nebula with dividing dust lanes that might be as famous as the Trifid nebula if it were as bright. Unlike SuperCOSMOS, there is no easy to use website to download IPHAS images. The official recommended software to retrieve IPHAS images is Astrogrid. As I do not have fancy graphics software to properly manipulate the FITS images provided by Astrogrid, I use a downloaded version of Aladin to view and manipulate the FITS files and convert them to a more widely-supported graphics format for further processing. Fortunately Astrogrid can pipe images directly to Aladin making them function essentially as one application. Although I've found Astrogrid and Aladin a bit tedious to use, I remind myself that creating images using this software is infinitely easier than using a telescope to capture my own! Over the next few months, I'll be making the most fundamental changes to the galaxy map since it was created. The result should be a more accurate and far more consistent map. Up to this point, this site has treated the various objects - stars, star clusters, OB associations, molecular clouds, HI regions, supernova remnants, radio sources, and so on, as independent objects and used independent distance estimates from the scientific literature to place these objects on the map. But these objects are not independent. Stars are part of star clusters. 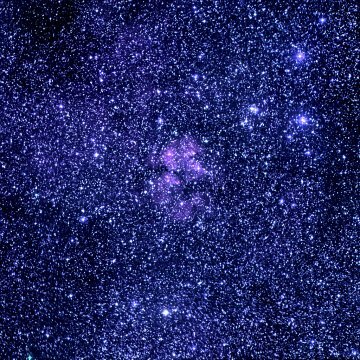 Star clusters are part of OB associations. OB associations are born from molecular clouds, ionise HI regions and generate radio sources. Although scientists recognise this interconnectness, all too often the available distance estimates are contradictory. One extreme example is the Trifid nebula. Analysis based on the velocity of gas measured in the Trifid direction using radio telescopes suggests that the Trifid nebula lies at a distance of 3010 parsecs. A visual examination of the A component of the 7 member O6 class multiple star HD 164492 at the heart of the Trifid nebula suggests a distance of 1680 parsecs. Including the other B-F components of HD 164492 suggests a distance of between 2500 to 2800 parsecs. But a recent study of NGC 6514, the star cluster that includes HD 164492, concludes that the Trifid nebula is much closer than any of these previous estimates - only 816 parsecs away. You can read more about these estimates in comments I posted on the Astronomy Picture of the Day site about the distance to the Trifid nebula. Some techniques for distance measurements are better than others. In particular, I'll be favouring distance estimates based on parallax or cluster photometry over estimates based on gas kinematics or photometric estimates for a single star. Objects are not independent. I'll be creating lists of related objects that are all at about the same distance. Of course the existence of these relationships will be sourced from the scientific literature. Then I can draw on the best estimate available for any one of this set of objects. As reliable parallax measurements are only available for stars within about 300 parsecs, in practical terms these assumptions mean that I will basing the map as much as possible on distance estimates to star clusters. A series of catalogs recently published by Ukrainian astronomer Nina V. Kharchenko and her colleagues will play a crucial role here. In particular, I'll be drawing on her new set of distance estimates for 513 known open star clusters and 7 compact associations as well as her discovery of more than 100 new open star clusters. The cluster data is based on the ASCC-2.5 catalog of 2.5 million stars drawn from the Hipparcos and Tycho bright star catalogs. I've prepared a list of the 143 existing Kharchenko clusters and compact associations and 19 new Kharchenko clusters that contain ionising stars (using Kharchenko's definition of probable cluster membership). Ionising stars are Wolf-Rayet stars, O-stars and B-stars of spectral class B2 or hotter. Over the next few months, I'll put up a detailed guide to these 162 bright ionising star clusters (BISCs), along with the best available distance estimates and their relationships to OB associations, HII regions, molecular clouds and more. Kharchenko's distance estimates are based on a relatively simple 2 colour photometric analysis. Nevertheless, in many cases this is the first photometric analysis done for that star cluster. If there is a better estimate available from the scientific literature, I'll also mention that in the BISC guide.